If gamblers, especially from South East Asia, go on a strike, life in Macau would come to a standstill. Yes, quite like Las Vegas, USA. 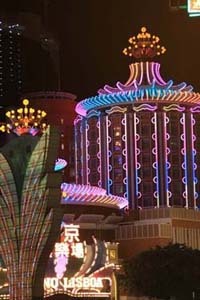 And because gamblers rarely make that mistake, Macau thrives. The city sleeps during day and gets active after sunset. Macau is a nocturnal animal. Macau has its own international airport but Hong Kong is a very popular gateway. I took the flight from Shanghai to Hong Kong. I could get a connecting ferry without going through the Hong Kong customs. Most visitors to Macau don't need a visa. Just a little tip, the ferry would allow one piece of bag per ticket. Additional bags will be charged at HKD 60 per piece. The guys from the ferry clear your bags even if your final destination was Hong Kong and not Macau. Likewise, you can avail your boarding pass for your final destination at Macau ferry terminal. Contrary to my belief, bags were not misplaced. The cost of the ferry from Hong Kong airport to Macau varies but HKD 235 per head would be a safe bet. The currency of Macau is Patakas, but Hong Kong Dollar is quite popular over there. Casinos will accept only HKD. At the time of writing, USD 1 got MOP 7.65. MOP & HKD are almost at par. 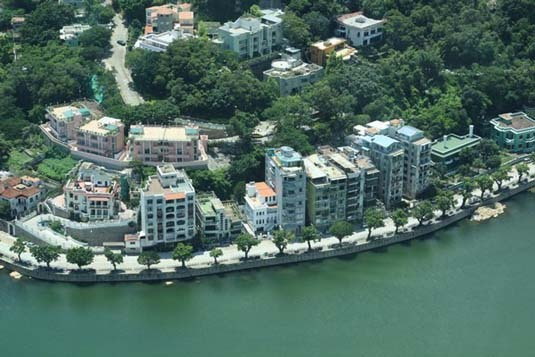 Macau has a population of 5.5 million that lives and works either in Macau Peninsula or the islands of Tapia and Coloane. These islands are connected by 5 different bridges with Macau Peninsula. Each of the bridge is very artistically built, especially the one named the friendship bridge. 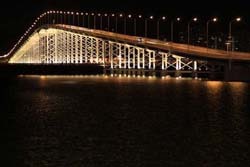 To me the bridge appeared as smiling lips. A Portuguese trader, in the 16th century, was passing by Macau when rough water threatened to damage the ship. The Chinese authority gave him the permission to unload his wares for drying. Thus began the trade and eventual Portuguese rule in Macau. 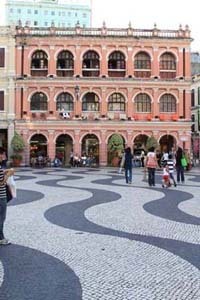 Soon Macau flourished thanks to entrepreneurship of Portuguese and Chinese traders. Macau became independent from Portuguese rule in 1999, but the legacy and the influence all around Macau is obvious and very charming. I was hosted at MGM Grand. I had an ocean facing room on the 15th floor. Every time I looked out, I saw boats and small passenger & cargo ships sail by negotiating the various bridges. I could also see Tapia and Coloane that made a beautiful backdrop as also the windmills atop a mountain in Mainland China. One can actually swim from Coloane village to Mainland China, but nobody does. And shouldn't. I was to be in Macau for 2 days and 2 nights. That evening, I decided to foot around. I walked through the streets and finally reached Senado Square - the most popular place for locals as well as tourists. Paved streets inlayed with black stones made a remarkably beautiful pattern. Buildings on both sides of the streets were a fine example of Portuguese architecture. The authorities have done well to maintain the heritage. Candy coloured buildings had boutiques, shops and restaurants at the street level. Whilst there, I was intrigued to see many people carry a typical brown coloured shopping bag with some Chinese calligraphy printed on it. I wanted to know what was within. English is not a popular street language so I worked with signs. Pointing at the bag I questioned. And each time I was directed to a street. Probably, the shoppers thought, and quite rightfully that I was asking for the shop's directions. Eventually, I realized that the bag belonged to Choi Heong Yuen Bakery, famous for its candied dry fruits, nuts and various meats. Give it a try. Some quick calculations and I realized that taking a half day site seeing tour would be more sensible as the cost of the tour would include entrance tickets to top of the Macau Tower and Macau Museum. Individually, both put together would cost more than the tour price. It was a good deal for MOP 108 for 5 hours with visits to some excellent heritage sites. Of course, I couldn't cover all, but got the essence nonetheless. By the way, MOP 20 tip was not included. The tip was actually asked for by the tour guide. There was no option! First stop was the Macau Tower. We went on the 58th floor for a bird's eye view of Macau and parts of China. Then we proceeded on the 61st floor from where one could opt to bungee jump or skywalk. I preferred the elevator to come down. It took me 40 seconds more, but that's OK, especially if the jump costs upwards of MOP 1500. I am told the jump ranks amongst the highest in the world. I will let my son know. Yes, my high blood pressure is an excuse! Next, it was a brief visit to Coloane village and the Tam Kung Temple, which essentially is the fishermen's God, known to protect the fishing folks from evil at sea. In return, the deity is offered lavish food and gifts and not to forget the bursting of fire crackers to announce the safe arrival of the fishing boats back from the sea. I walked the streets that took me back in time. Houses with Chinese and Portuguese architecture were indeed captivating. In Coloane village, there's a bakery that's famous for its Portuguese egg tarts. The technique and recipe has been passed down from generation to generation. You may want to try the tarts. From there we moved on to Taipa Houses-Museum. A portion of road with Portuguese homes has been converted into a museum. Pastel green homes, overlooking a small lake were equally pretty. The location is quite popular with newly weds to have their pictures taken. I was witness to one such beautiful bride. While moving on to Cotai Strip, we passed a street in the corner of which was an eating place. The place was full to the brim with crowds enjoying their pork chops. Pork was always a preferred meat of the Portuguese. Goa, in India, which was also under Portuguese rule well up to 1962, stands testimony to pork preparations. Cotai Strip, probably is called so since it follows the steps of its big brother from Las Vegas. Cotai Strip has Hotels & Casinos. As if, existing rooms were not enough, construction was in full swing to build thousands and thousands of more rooms. As we moved towards Macau Museum on the Macau side, we passed by the Jockey Club, Golf Course, Macau Stadium and the Macau International airport - home to 12 airlines that connect to 25 destinations. Macau Museum is a must do for people who are short of time. In about an hour I could go through Macau's early period, its development and commerce, its culture, its homes and artifacts. 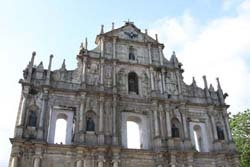 Walking distance from the Macau Museum are the ruins of St Paul. Only the fa�ade remains of what once was a very elaborately built Church. Massive fire gutted the Church which was made from wood. The last stop on the tour was Lisboa - Hotel & Casino. Lisboa was Macau's first casino when gambling was made legal in 1970. 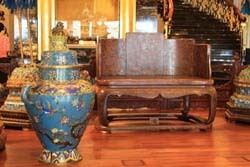 Founded by Dr Stanley Ho also nicknamed Gamble King has put on display some of his personal collection of antiques notably a wooden chair made during the Ming Dynasty which he bought at an auction for nearly HKD 14 million. Crystal Palace, as the name suggests, is a theme casino elaborately decorated using crystals. It has a ceiling that has 36,000 crystals studded. From Lisboa, I walked back to my hotel. I am not a gambler. But that didn't prevent me from exploring some famous hotels & their casinos. It's a good idea to shunt between various casinos in a taxi. They are not expensive. However there's a better idea that's free. Most of the hotels & casinos have free shuttle services that run at regular intervals to & from the ferry terminal. Apply the hub and spoke rule. Check a hotel and come back to the ferry terminal. Hop on another bus and back. I did this a few times and discovered The Venetian, City of Dreams and The Wynn. It would be hard to say, which one is better. Venetian boasts of Roman grandeur in its architecture. It hosts shows that are famous. Whilst I was there, Cirque du Soleil was on. I certainly missed it since the next show was scheduled on the day I was leaving. If you have kids with you, you may want to park them at the Cube - an electronic entertainment arcade while you roll the dice. Manchester United store has put up MU Experience wherein one can kick balls and get points & grading� eventually to improve your skills at the game. City of Dreams is built around the concept of water. Bubble shaped chandeliers and water walls are magnificent. The Bubble is a sphere that has a multimedia show. The one running was Dragon's Treasure. A 15-minute burst of lights, music and graphics that take you below the ocean. A must see. And the fun is it's free! 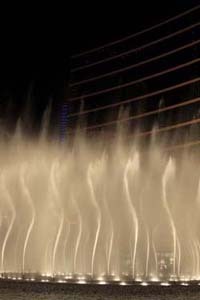 Wynn is contemporary and as big as its competitors. I am sure, other hotels & casinos in this magic land would be equally fun to be in. I had to head back home. Office was calling too. Sad, for some people there's no lucky money.